MASTERS 2019: It just doesn’t get any better than Masters week, does it? Don’t get me wrong, I love all the majors, but for me, this tournament stands alone. It’s a unique event in many ways, and the course, Augusta National, is at the center of it all: it has an intoxicating quality that anyone who has ever set foot on the grounds can attest to, and this shines through even on television, aided by those soothing guitar licks and the smooth baritone of Jim Nantz (straight into my veins, please!). All the stars are out, of course, and most have planned their early-season schedules around this tournament, with the goal of peaking this week. Winning the Masters is a ticket to golfing immortality– you’re forever a part of the game’s most exclusive fraternity, with perks that include a lifetime invitation to compete in the tournament and a lifetime membership to the club. Patrick Reed’s victory last year made him the latest member of this fraternity, and though he’s certainly not the most beloved guy on Tour, his Champions Dinner menu– prime bone-in ribeye, mac & cheese, creamed corn, and a couple of green veggies– is sure to win him a few friends, especially among those who have been there for some of the more… uh, adventurous menus (Vijay Singh comes to mind). But really, when thinking of or talking about this tournament, it begins and ends with the course. 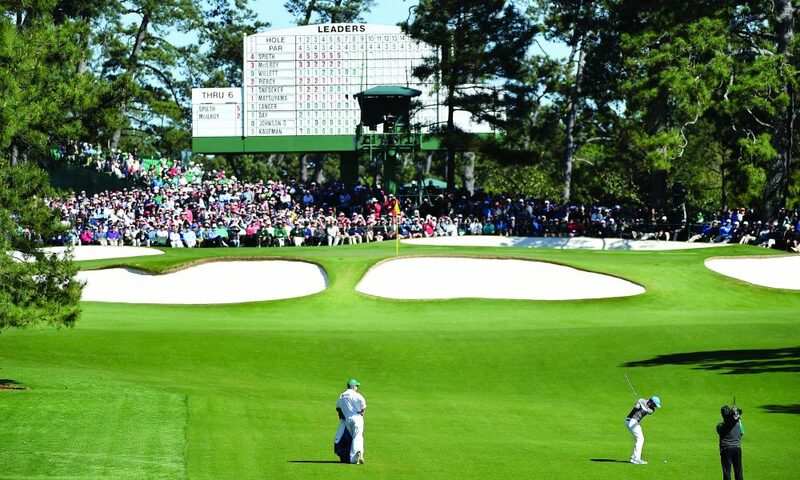 Designed by Bobby Jones and Alister MacKenzie in 1933, Augusta National has become one of the true cathedrals of the game, and the back nine in particular is perfectly designed for dramatic championship golf, as scoring opportunities abound, but disaster is always lurking. Several holes have been lengthened over the years, new trees have been planted, and rough now exists where for years there was no rough at all, but the basic character of the course remains the same: it’s fairly generous off the tee, distance control with the irons is at a premium, and the greens are undulating and super-slick. The type of players who generally excel at Augusta are those who are long off the tee (the longer players can absolutely dominate the par-5s), can work the ball from right-to-left, and display both imagination and nerve around the greens. Rickie Fowler (21.0)- Fowler has a tremendous record in this tournament, making the cut in 7 of his 9 appearances and nearly getting the job done several times, including last year, when he finished runner-up, a shot behind Patrick Reed. He’s logged 14 under-par rounds at Augusta National and his stroke average is actually under par (71.77), which is very rare for a player with so many rounds under his belt. The rap on Fowler is generally that he doesn’t win enough, and while there’s some truth in that, he’s just a few weeks removed from a victory in Phoenix, and he followed that up with a runner-up finish at the Honda, so he’s been in and around the winner’s circle recently. And Rickie generally likes to play the week before a major, so he was in San Antonio last week, where he shot 10-under over four rounds to tie for 17th at the Valero. With his record in this event and his current form, there’s a lot to like here, and 21.0 is a very fair price. Louis Oosthuizen (48.0)- Oosthuizen had some difficulty with Augusta National early in his career, but he’s figured it out and has been rock-solid in this event over the past decade, finding the top-25 in 4 of his past 5 appearances (including T12 last year) and finishing runner-up back in 2012. He’s broken par in 14 of his 32 competitive rounds at Augusta, and he’s been particularly impressive on Sunday, ranking in the top-5 among active players in final-round stroke average. His game is in great shape right now, as he finished runner-up in the Valspar in his last stroke-play start and then made a deep run in the Dell Match Play before losing to eventual champion Kevin Kisner. All things considered, I think Oosthuizen is in a better position to win this tournament than he has been at any point in his career, and at nearly 50/1 I consider him the best value on the board this week. Henrik Stenson (96.0)- When looking for a longshot in this tournament, most will seek out young guys who are playing well but are priced generously due to their limited experience. You’re looking to strike gold with a Danny Willett type, in other words. This year, however, I’m taking a different approach– Stenson has become a forgotten man due to injuries, age, and a spotty schedule (which is no doubt influenced by the first two factors), but he’s actually been playing some pretty solid golf over the past month, finishing 24th at the Valspar and 17th in Bay Hill. And like Oosthuizen, he’s gotten better and better at Augusta National over time, with last year’s 5th-place finish the high-water mark in a career that includes 14 appearances and 44 rounds logged. We’ve seen veterans who were regarded as past their prime win this event before, so a lightning strike from Stenson here wouldn’t be unprecedented. Plus, it’s not like he’s some old man– he’s only 43, and still long off the tee. He’s my favorite bet among the guys hovering around 100/1.